The most intense of the Greenland kayaking tours: 100 km of kayaking along a little known route in southern Greenland: fjords set between jutting rock cliffs, huge icebergs, glacier fronts… Thanks to the stability of our double kayaks, no previous kayaking experience is necessary to enjoy exploring fjords silent except for the sound of our paddles, or to set up camp in almost inaccessible places. To top it all, climb to the foothills of the legendary Inlandis plateau. 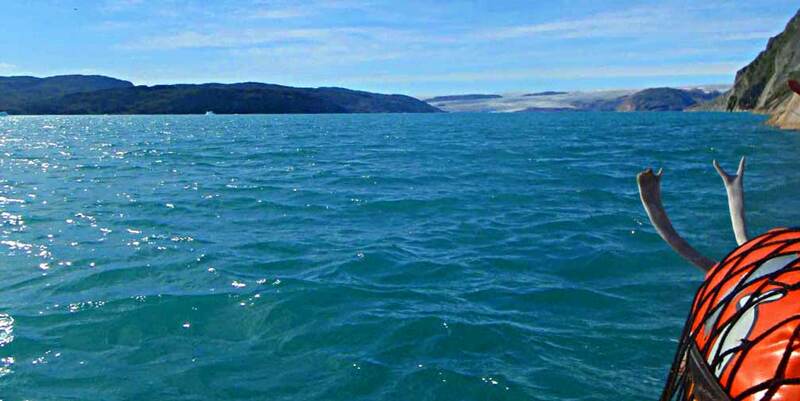 Kayaking amid icebergs to reach the glacier fronts of Qaleraliq, the Perito Moreno of the Arctic. Hiking on a glacier tongue to the moraines that lead to infinite plateau of the Inlandis. Experiencing a never-ending day (until mid July) or seeing the northern lights (from mid August). Three-hour flight from Keflavik (Iceland’s international airport) or Copenhagen to Narsarsuaq (Greenland) with breathtaking views of Cap Farvel and the huge southern Greenland ice sheet … I ‘m having the window seat! Welcome at the airport by our English speaking guide and transfer to the port of Narsarsuaq. An hours crossing by high-powered zodiac to the city of Narsaq, our last contact with civilization for a week. Once settled in our hostel off we go to our supply store to get kitted out with kayaks, paddles, clothing and navigation accessories. If conditions permit, we make first contact with water to get familiar with the use of the rudder. Overnight stay at the Kayak Hostel. Tranfer by zodiac boat to Qingaarsup island (one of many strange names we’ll hear!) where we will start the kayak expedition. We will follow the coast along the ice covered fiord among the icebergs coming from Eqalorutsit glacier. 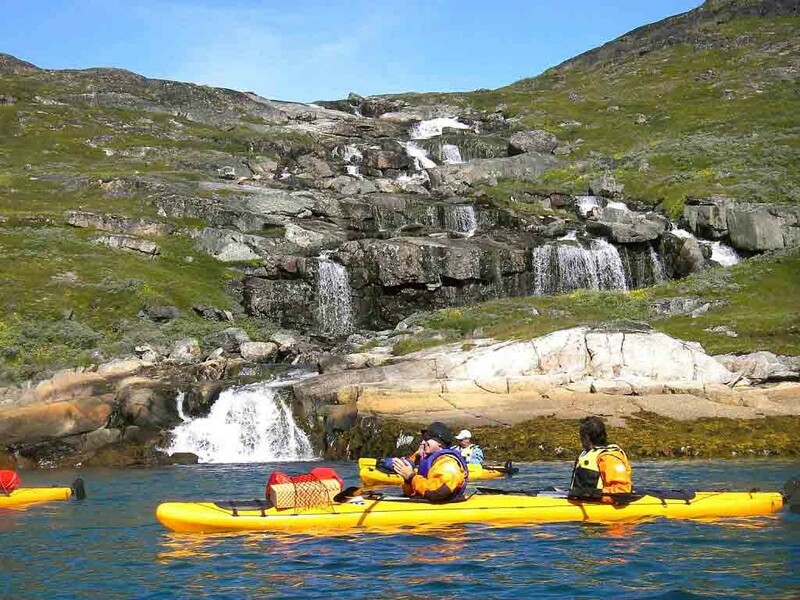 In this area, full of ringed seals, there is usually a greater density of ice, slowing down the kayak and sometimes even blocking access at certain locations. When we start the crossing to Nuulussuaq peninsula through we get the first views of the Inlandis, the polar cap. Once we arrive to Nulussuaq, we will install our camp and have a spot which was one of the Viking settlements in South Greenland. Camping overnight. Icebergs on the Maniitsup Tunua fjord and group photo! After breakfast and packing the tents, we sail to the end of the fjord (4 km), disembarking to enter the perpetual Inlandis ice sheet. 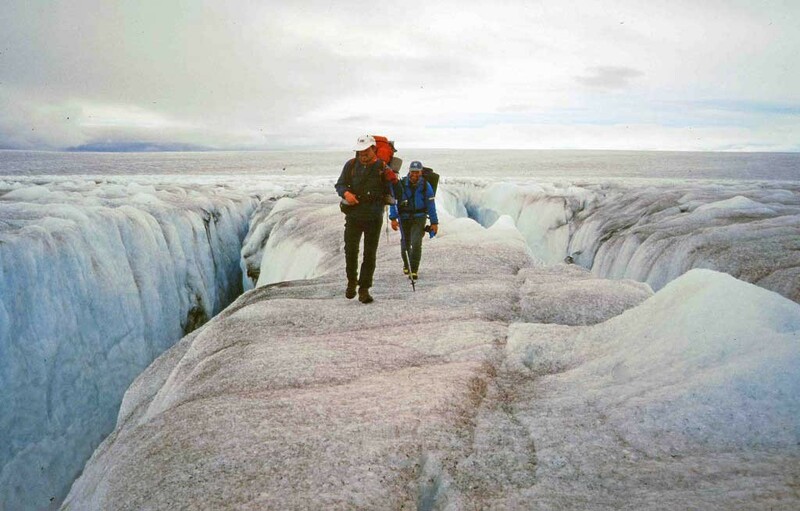 It is a steady and easy climb along the last glacier tongue, enjoying the sights of the rimayas or large transverse cracks, as we approach the great moraine (mixture of ice and sediment) that leads to the 2,500 kilometers of icy plateau to the north of the island. In the afternoon we are sailing again, this time passing three glaciers in the direction Akulariuseq (Caribou Island), where we set up camp after having paddled about 10 kilometers. Camping overnight. 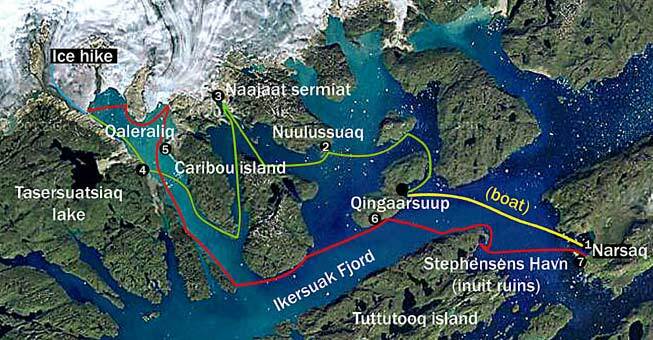 We start the final day with diagonally crossing the 8 km of the Ikersuaq fjord towards the big island of Tuttutooq where we shelter in Stephensens Bay and visit the inuit ruins of Manitsuarsuk (settlement of fishermen and hunters, inhabited until the eighteenth century ). After eating we head off to Narsaq town, where we will find being back in civilization almost exotic! Once settled in our hostel off we can do some shopping or visit the museum, the fish market, the church, etc,. Dinner the last night in Narsaq usually in a restaurant, is not included in the tour price but of course, it is possible to use the hostel kitchen. Overnight stay at the Kayak Hostel. In the morning we take the zodiac to Narsarsuaq, where after checking-in at the airport, you can visit the Bluie West One Museum, former US militay base frozen in time since the second world war. Optional: Qooroq ice fjord excursion. The Qooroq is one of the most active glaciers that can be found in southern Greenland. We will navigate to the area where iceberg density will make it impossible to carry on, and which is without doubt one of Greenland’s best images (566 DKK or 85 € per person, 6 participants minimum). Flight from Narsarsuaq to Keflavik (Iceland’s international airport) or Copenhagen. Special discount June departure: -100€! From 13th to 20th of August. From 20th to 27nd of August. From 27th to 03rd of September. From 03rd to 10th of September. Flight from Reyjkavik (or Copenhagen) to Narsarsuaq. Return.